It seems that Dr. Dickson Despommier (the professor of public health at Columbia University who came up with this idea) knows nothing about plans to build this in Las Vegas. This rumor was reported by many reputable websites on 1/4/08 with no mention of Despommier. So, for now, this is a rumor. Las Vegas will be the premier city for a new concept - urban farming. This 30-story farm will supply enough food to feed 72,000 people. In this case, the produce will go to resorts. With annual revenue of $25 million from produce and another $15 million from tourists the 30-story vertical farm would be about as profitable as a casino, with operating expenses only being about $6 million a year. 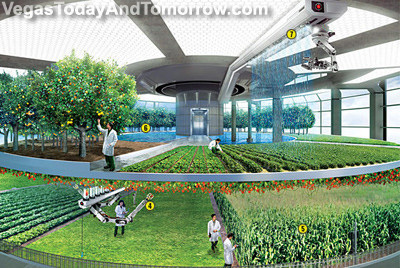 The world currently uses about 80% of the available farm land and 60% of the earth’s population lives near or in an urban environment, so the logical choice for future farming is to go vertical for land where the environment can be controlled, water evaporation is minimized, and distribution is local. Las Vegas is seen as the perfect location for this project by Nevada State officials who would like to demonstrate their sustainability and environmental awareness, instead of projecting an image of waste and excess. Final design, location and other details are yet to be announced. 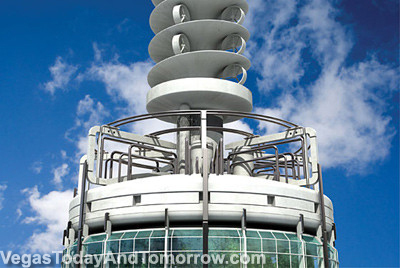 The project is slated to break ground in 2008 and be operational by 2010. 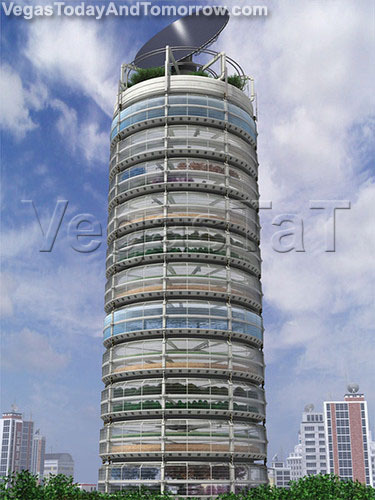 "Vertical Farm and interior Designs by Chris Jacobs"